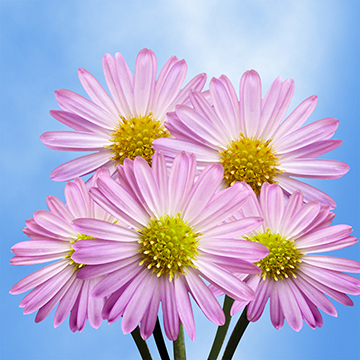 Aster is a Greek word meaning "star", referring to the shape of the flower head. They are daisy-shaped flowers, usually with a yellow center and with numerous flowers blooming from each stem. They come in purple, white, and pink and are excellent fillers for your arrangements. Aster Pink 100 stems. Each stem has several blooms. Your flowers and roses are shipped absolutely fresh, direct from the greenhouses to you via FedEx. Globalrose sells wholesale flowers and wholesale roses at prices that are usually lower than most local wholesalers. All our flowers and roses are cut specially for you, your loved one or special event (wedding, party, fundraising event, birthday or holiday), 3 days before they are delivered to your door. Color tones for all flowers and roses may vary due to the computer monitor and/or Mother Nature.